The holy forest of Sangeh is full of nutmeg trees and a home for hundreds of monkey. There is also a sacred temple that holds the history and culture during the period of the Kingdom of Mengwi namely Pura Bukit Sari. Amazing temple in the middle of nutmeg forest! The area of holy monkey forest Sangeh is about 6 hectares and covered by the nutmeg trees which reaches a height of 40 meters. This nutmeg forest is a living place for monkeys which is divided into three groups, the eastern side, the mid and the west side. The holy forest is a sanctuary of grey long-tailed macaques. The monkeys are respected by locals as sacred creatures. These monkeys are believed as the descendants of the monkey army of the King Hanuman. The monkey were not too wild but visitors should keep an eye on their belonging. There also identified other species such as birds, mammals, reptiles, amphibians and arthropods. The Sangeh Monkey Sanctuary is strategically located in a side street in the village of Sangeh, District of Abiansemal, Badung Regency, Bali. 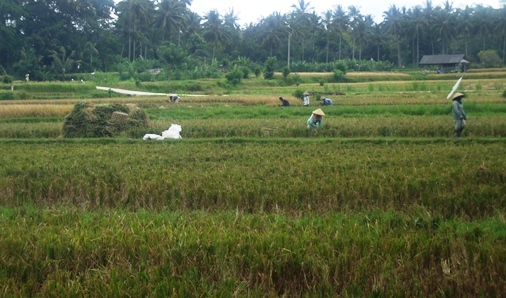 This place is locatabout 23 kilometers to the north from Denpasar City or about 50 minutes. The visitor can access this place Directly from Ngurah Rai International Airport, about 35 kilometers or 1 hour 30 minutes. The sanctuary is also close to Pura Taman Ayun, about 12 kilometers or 20 minutes. 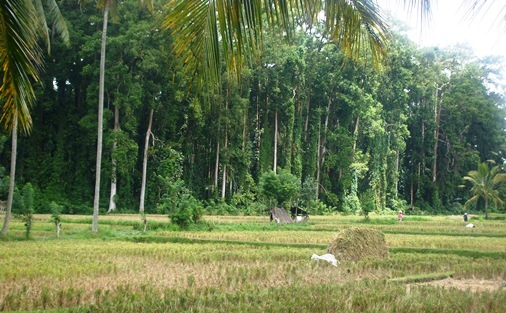 The soil around the forest is very fertile and there are still vast rice fields. Sangeh monkey forest is equipped with tourist facilities such as souvenir shops, restaurants, parking, toilets and others. This attraction is managed by some special organizer of local village. The organizers also worked together with staff from Forestry Department and KSDA. There are also a sacred temple namely Pura Sari Temple, located in the middle of holy monkey forest Sangeh. The temple existence is mentioned in the ancient manuscript "Lontar Babad Mengwi". The manuscript mentioned about the Daughter of Ida Batara in Gunung Agung. The princess wish to be worshiped in Mengwi Kingdom. 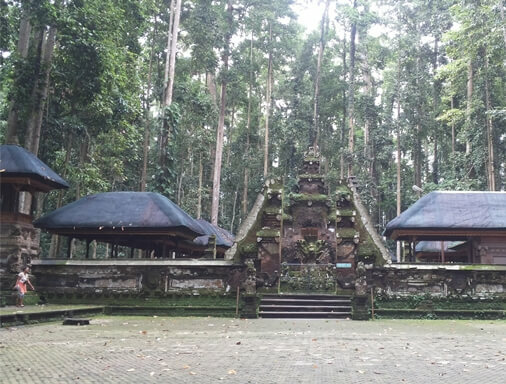 By the will of Ida Batara Gunung Agung, the nutmeg forest around the princess residence in Gunung Agung moved at night time to Mengwi Kingdom. Time has changed to the noon and the transfers were not yet reach the kingdom. This situation is already seen by people and causing the forest can no longer continue the journey to the Kingdom of Mengwi. It stopped in the village of Sangeh. The First King of Mengwi Kingdom namely I Gusti Agung Putu known as Cokorda Sakti Blambangan have an adopted son namely Anak Agung Ketut Karangasem. Anak Agung Ketut Karangasem found traces of the building shrines in the nutmeg forest. Knowing the news of the discovery of Anak Agung Ketut Karangasem, then Cokorda Sakti Blambangan ordered his men to rebuilt the temple. Further more the temple is to be known as Pura Bukit Sari or Sangeh Monkey Temple Bali. This sacred temple serves as Stana to worship Ida Batara Gunung Agung and Batara Melanting. This is a great place and worth a visit! Take your time to travel to Monkey Sanctuary Sangeh Bali , hopefully helpful and thank you. 2. Ulun Danu Bratan Temple.